Alan Lockwood, M.D., is a man with a mission — to educate the public about the health effects of burning coal. “Research on toxins has been my life’s work in one form or another,” he said. Lockwood spoke last week to two Omaha audiences, including a presentation at the UNMC School of Public Health. Lockwood, a retired professor and board member of Physicians for Social Responsibility, is on a book tour to raise awareness about the diseases caused by pollutants generated from burning coal. The Silent Epidemic: Coal and the Hidden Threat to Health was published last month by MIT press. The book is an expansion of a 2009 paper by Physicians for Social Responsibility, “Coal’s Assault on Human Health,” available for free on the PSR website. “Coal combustion releases sulfur dioxide, particulate matter (Pm), nitrogen oxides, mercury, and dozens of other substances known to be hazardous to human health,” states the online PSR report. Oxides of nitrogen react with volatile organic compounds in the presence of sunlight to produce ground-level ozone, the primary ingredient in smog. Other coal derived pollutants are arsenic, beryllium, cadmium, chromium, nickel, hydrochloric acid, hydrofluoric acid, dioxins, formaldehyde, uranium and thorium. Lockwood told his audiences that the United States burns about a billion tons of coal each year, which produces 100 million tons of coal combustion waste or coal ash. The obvious health effect of breathing pollutants is the impact on the respiratory system, which should be of special concern to Nebraskans. According to the CDC, lung cancer kills more people in this state — both men and women — than any other cancer. A 2007 Asthma Report for Douglas and Sarpy Counties prepared by the American Lung Association and the Omaha Asthma Alliance, stated that between 1990 and 2004, 237 residents died as a result of asthma. The Omaha area death rates, while declining from a high in the mid-1990s, were higher than both the Nebraska and U.S. rates. Consistently, the highest average asthma death rates occurred east of 42nd Street in Douglas County. The average annual asthma death rate for African Americans was more than double the rate of Caucasians. Other diseases linked to coal pollutants include heart disease, stroke and even diabetes. Asked to explain the mechanism for creating disease, Lockwood said the danger began with particulate matter, measured according to two sizes, very small particles less than 2.5 microns and particles less than 10 microns. It is the very small particles that do the most damage when inhaled deep into the lungs. Another mechanism for creating disease is oxidative stress or the creation of oxygen free radicals. “The concentration of oxygen free radicals can be increased through exposure to environmental substances such as air pollution, tobacco smoke, pesticides, and solvents. When their concentration is excessive, these highly reactive molecules damage lipids, proteins, DNA, cell membranes, and other cellular components,” according to the online PSR paper. Coal fired power plants are one of the leading sources of mercury emissions. Mercury released into the atmosphere combines with rain and enters the food chain through fish. Mercury is a known factor in neurological and developmental impairments in children. Lockwood stressed that coal presents health hazards along every stage of its life cycle- mining, transportation, washing, combustion, and disposal of coal ash. When asked about “clean coal,” Lockwood explained that the phrase referred to washing coal to remove rocks and has come to include the idea of capturing and sequestering carbon. “There is no such thing as clean coal,” he said. 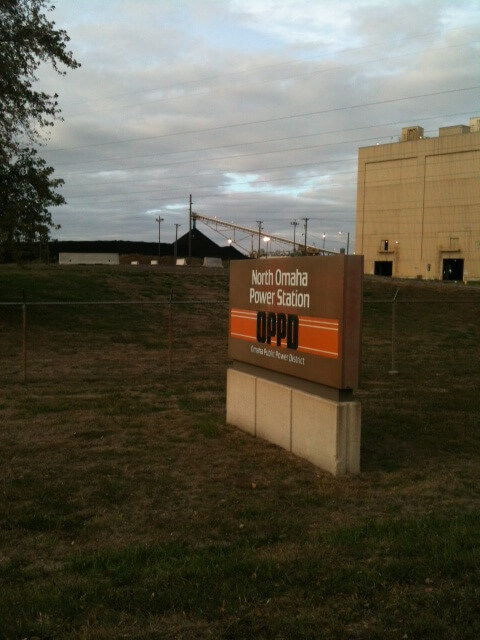 At North Omaha Station, OPPD officials test emissions on a continual basis to ensure that the plant is in compliance with EPA standards for air quality. The EPA maintains a toxic release inventory at www.epa.gov/tri to inform the public of the total amount of pollutants produced by any facility in a given zip code. In 2011, the amount of mercury released at the plant was 302 pounds into the atmosphere and 308 pounds in the coal ash disposed on site. The coal ash is recycled into concrete and is held in an unlined, uncovered pit before being transported off-site. Arsenic is present in the groundwater below the pit, but groundwater in Omaha is not used as a drinking water supply. A sampling of yearly emissions data provided by OPPD, not on the www.epa.gov/tri website includes 205 tons of large particles, 75 tons of small particles, 14,069 tons of sulfur dioxide and 6,742 tons of oxides of nitrogen.